I come across a lot of skincare products, and in all honesty, I usually don’t find too many that are really innovative. So, although I try something once, I generally revert to my regular regimen as it has proven to be quite effective for me. 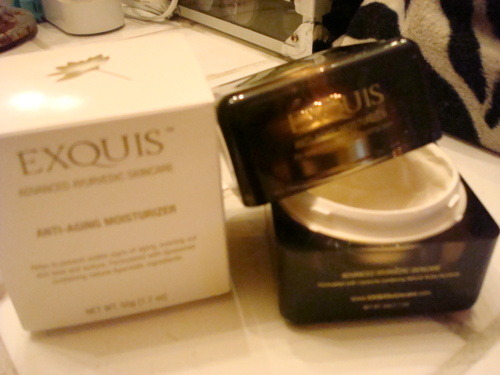 However, I was ridiculously thrilled when I sampled the Anti-Aging moisturizer from the EXQUIS skincare line (www.EXQUISskincare.com) and realized that this was a product I actually wanted to use. Founded by Dr. Kalidas Kale who has over 25 years of pharmaceutical R&D experience in the area of dermal and transdermal drug delivery, Dr. Kale wanted to develop something that could literally change the face of skincare. For over ten years, Dr. Kale began perfecting his formula and finally developed what he believes to be “the perfect system” for dermal delivery by blending his leading delivery system with both Natural Ayurvedic and Western world ingredients. Ayurveda is the ancient art of medicine practiced in India for thousands of years. EXQUIS products contain traditional Ayurvedic ingredients including turmeric, sandalwood, basil, neem and jasmine. These are best known for their extensive anti-inflammatory, calming, and healing properties. Additionally, EXQUIS products contain antioxidants, moisturizers, and vitamins. But beyond just the ingredients, EXQUIS sets itself apart with great advances in cutting edge skincare research and technology. The advanced liposome technology used in EXQUIS skincare products provides a vastly superior method of active ingredient delivery. This breakthrough method allows nutrients to penetrate through outer layers of the skin to reach the deep layers. As a result, EXQUIS products are incredibly effective and gentle on the skin. Think Sundari (Former model Christy Turlington’s skincare line) but with the added benefit of advanced liposome technology so it can truly penetrate the skin! That being said, I have definitely seen a difference in my skin tone after continuously using the Anti-Aging Moisturizer at night. When I first applied it to my skin, I originally thought it was a bit too sticky, or rather, it was such a humectant that my face literally felt like it does on a humid day! But, I soon noticed that the cream easily penetrated my skin. And as the box claims, this exquisite cream delivers a proprietary formulation of anti-aging actives to the Dermis, the inner layer of the skin, where it is released and begins the process of cell regeneration and reparation. I could noticeably tell after a few days that my skin tone, texture and radiance had improved, and even better, it has smoothed some of my “fine lines” (all while simultaneously normalizing cell regeneration). Perfect for someone like me who plans to stay youthful, both physically and emotionally! Although I don’t have this problem, another plus: the Anti-Aging Moisturizer is very effective in relieving the symptoms of hard to cure Eczema in Adults. The package is quite upscale in a brown transparent plastic cube encasing a gold orb that contains the cream and may be a bit pricey at $135.00 for 50mL of cream. But, the stuff works, so I like to think of it as an investment in youthful-looking skin!